The process for colour correcting is also sometimes called finishing, because it’s typically the last step of the final cut stage in editing. 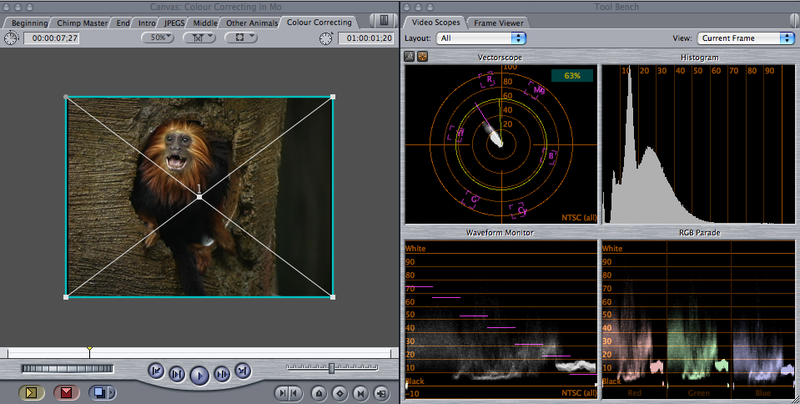 The colour correction itself depends on the project and relies on the editor having a good eye for colour. It’s essential to learn the fundamental principles that are applied to any good colour correction. To begin, one should know about controlling the contrast. The difference between the lightest and the darkest parts of the image is referred to as contrast. 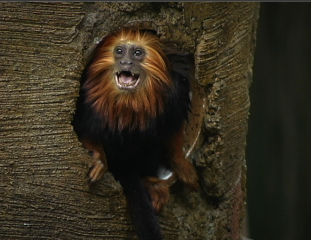 We can control the contrast in any image using the Video Scopes in Final Cut Pro. Choose Window > Arrange > Colour Correction. The Video Scopes will automatically open. Using the Video Scopes window, you can control the brightness of what are called the traces, Traces are the representation of the video date. There are two trace buttons located in the upper left of the Video Scopes window: the Display, or Traces Brightness button is on the far left and the Scales Brightness is to its right. When you click on the Display Brightness button, a control slider appears. Dragging the slider will adjust the brightness of the video date in the scopes. Click the Scales Brightness. Adjusting this scale changes the brightness of the gauges in the Video Scopes. Any image can be broken down into shadows, mid-tones, and highlights. In Final Cut Pro, these three characteristics are referred to as blacks, mids, and whites. 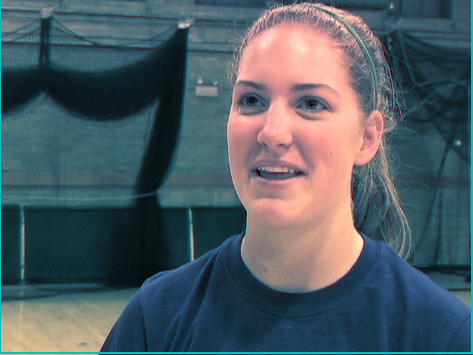 When you begin your evaluation, start by scrubbing through the image to determine the areas that are brightest. To focus on the brightest parts of the image it’s best to remove the colour. Desaturate removes all the colour from the image so that now you can focus better on the darkest and lightest areas. The different levels of brightness become more apparent. In the coloured version, some areas seemed darker because of the coloured tint. Now these areas show a bit more detail. 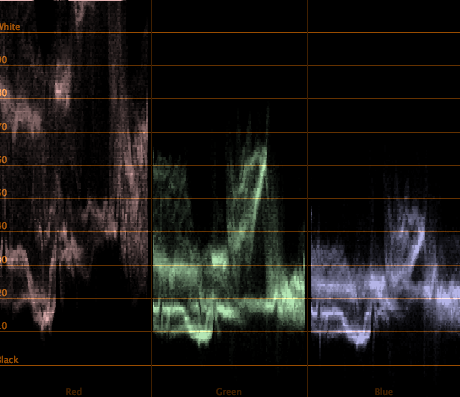 In the Video Scopes, the Waveform Monitor graph will help us to judge what is called the contrast ratio, which determines how much difference there is between the blackest black and the whitest white. In this example, the Waveform Monitor graph tells us that the contrast ratio for this image is small. To have a high contrast, the whites should spike in the graph to 100 percent luminance, while the blacks fall into the 0 percent area. The widest possible contrast accounts for the crispness of the image and is more visually appealing. However, a low contrast ratio appears washed-out and dull, and may limit your ability to control the colour. The lighting used to shoot an image can be broken down into high-key and low-key lighting, which allows us to distinguish the different ways to light a scene for dramatic effect. High-Key – images are brightly lit, shadows appear to be softer. These images are often used to convey an upbeat, happy situation or lighter mood. However, high-key also happens to be low contrast. Most of the luminance values are found throughout the mids. These terms have carried over to the colour correction gauges. But it doesn’t necessarily follow that an image with a high contrast ratio is also a low-key image. Sometimes it depends on the amount of brightness and visible detail in the midrange of an image. The Colour Corrector 3-way filter has an interface with 3 colour wheels and control sliders underneath to push and pull the luminance values. We’ll concentrate on the luminance values for now, using the sliders to control the contrast in your images. 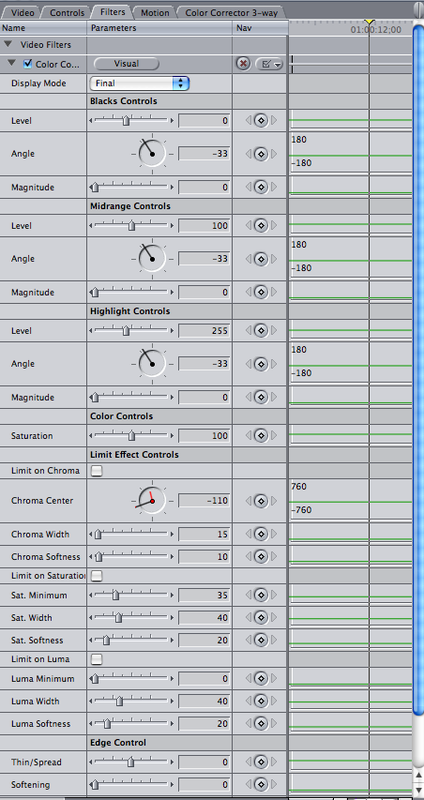 As you can see, the first slider controls the black levels, the middle the Mids, and the third the White levels. 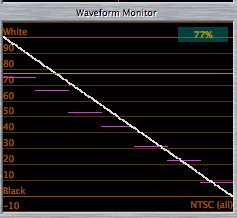 Using a gradient that shows the gradual transition from white to black, you’ll see the corresponding graph in the Waveform Monitor show a direct correspondence. 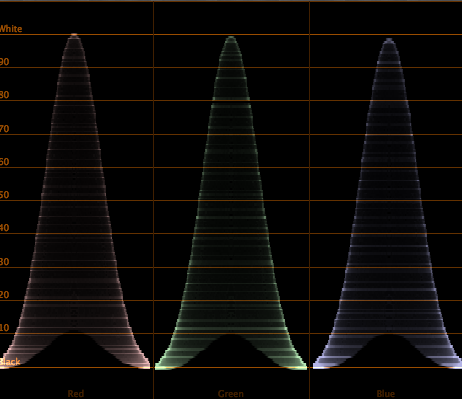 Notice that in the Waveform Monitor the gradient ramps diagonally from 100 percent luminance (white) to 0 percent (black). This gradient provides an ideal test image to see how changes you make in the 3-way Colour filter affects the luminance in an image. When you add the 3-way Colour Corrector filter, notice that there’s an additional tab at the top of the Viewer. When opened this tab contains a custom interface for the filter, providing greater control over the luminance in your image. Click the disclosure triangle to the left of the filter’s name to view the filter’s parameters. You’ll see there’s quite a load of parameters, but don’t worry about them now. 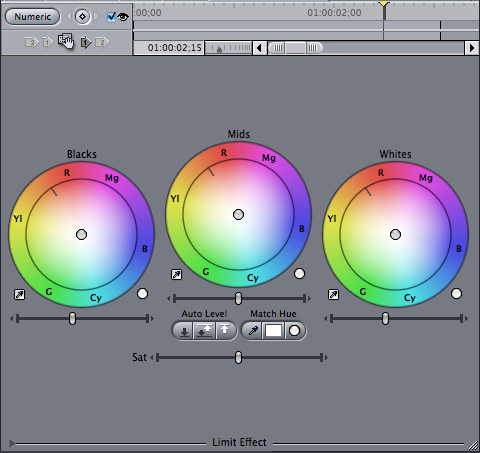 Every one of these parameters is represented by a graphical control in the Colour Corrector 3-way tab. For now, go to the 3-way graphical interface. 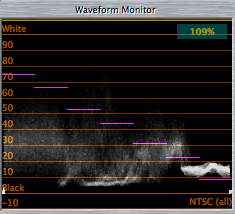 In the Video Scopes window, under the Layout menu, select Waveform to display just the Waveform graph. Finally, when you select the Colour Correction 3-way in the Viewer tab, your interface in Final Cut Pro will look like this. Drag the white slider to the left to lower the white level. The light parts of the image become darker and the white part of the graph diagonal is now lower. Notice that the black portion of the graph didn’t move. Any change you make to the white levels will not affect the black. However, any changes you make to the black levels will also affect the white. As you can see for yourself, when the Blacks slider is moved to the left, not only does the black portion of the graph also move left, but the white levels fall below 100 percent. 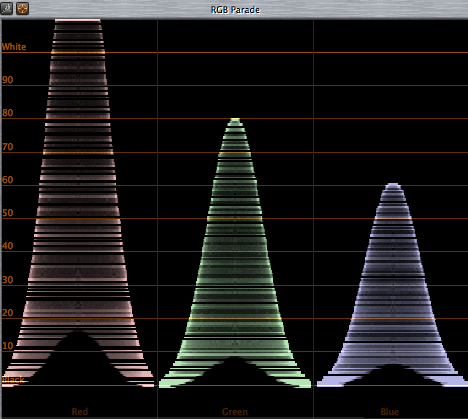 Also, if you adjust the Mids first, the effect on the graph in the Waveform Monitor is even more dramatic. Moving the Mids slider to the left, reshapes the graph into a downward curve, which moves down the white point. Dragging the Mids slider to the right has the opposite effect, pushing the grey tone to the right, causing the graph to curve upward. We can now conclude that any changes made to one part of the image will require you to change the others. However, there’s a proper sequence to changing the contrast. Blacks should be adjusted to 0 percent, resulting in deeper, richer blacks, which will make the white values pop out more in comparison. You can see that in our image of the tamarin, that the black levels are just touching 0 percent. These blacks correspond to the dark areas to the right of the monkey. Still, you could make a subtle reduction in the black levels. Click the arrow to the left of the Blacks slider a few times until you see a slightly deeper black level. You can also press the Command key while using the slider to force slower, finer adjustments. As more dots bunch up at the black line, the result is typically referred to as crushing the blacks. Doing so will increase the deepness of dark areas, but could compromise the detail in your image. Once you have the Blacks set up, you can now adjust the Whites. Adjusting the Whites is the second step. Drag the Whites slider until the white points in the graph reach 100 percent. Notice how much difference boosting the Whites makes. Areas that were dark now show more detail. white levels should never exceed 100 percent. 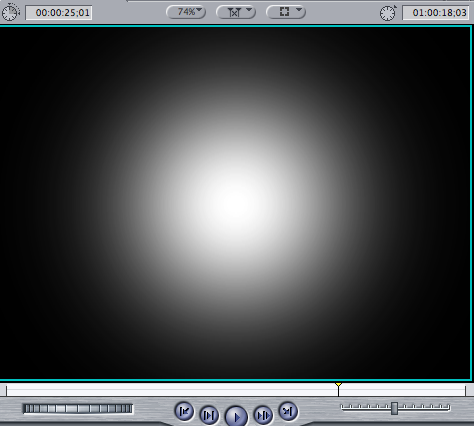 As you play the clip, you may notice that the whites appear to be glowing. Make sure when you adjust the whites that you are doing so for the whitest portions of your entire clip. Otherwise, some portions of your clip might actually exceed legal limits. Finally, the third step to adjusting contrast is the last. You can now brighten up the midtones by adjusting the Mids. Midtones are just a bit more tricky. Dragging the Mids slider to the right pushes the whites and they might even exceed 100 percent. Reduce the Whites until they are legal again. In the Filters tab at the top of the Viewer, toggle the check box for the filter off and on to see what difference you made in the image. Make further adjustments until you are satisfied. Adjusting the Whites and the Blacks sets the contrast range for the image. But adjusting the Mids also helps set the image’s mood. This adjustment, however, is more subjective, depending on whether you want the image to be high-key or low-key. The midtones is the luminance region that has the most detail and this distribution is what defines the mood of the shot. For instance, subtle variations in midones could influence the perceived time of day – midday, afternoon, or evening. You can make sunlight bright, or a bright sunny day look overcast. It all depends on what you want. Remember, when you adjust the Mids, the Whites will change correspondingly. Make sure that the White levels are always adjusted to legal limits for broadcast – 100 percent. Achieving colour balance is a trial-and-error endeavour, where you push and pull the colour balance until you get a satisfactory image. You can modify colour to alter the mood of a scene, or to correct what is perhaps one of the most common colour issues – poor white balance. It’s important that you learn how to evaluate the subtle differences in hues within a shot and to work towards correcting it. It’s important to get a better understanding of how to use the colour wheel in the Colour Balance controls, and also how to use the Vectorscope. 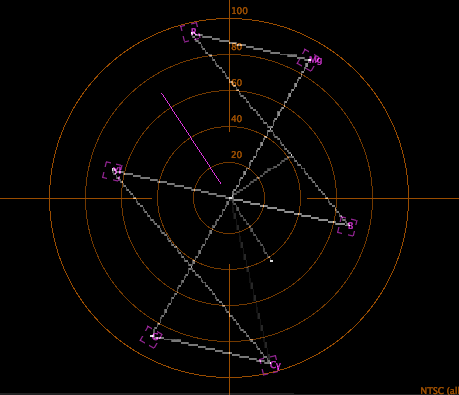 The Vectorscope is a graph that is analogous to the colour wheel, to help you align the proper hues with their respective colours (hue), and to control the intensity of the colours (saturation). The Colour Wheel is where you can find the three primary colours used in video systems – Red, Green, and Blue, or RGB. By mixing these primary colours you can create any colour in the spectrum. The secondary colours are those that fall opposite the primary colours. They are Cyan, Magenta, and Yellow. For example, yellow is a combination of green and red. Any two colours that are opposite one another are considered complementary. Combining complementary colours has the effect of neutralising the colour, or desaturating it. In the colour wheel, you can see this effect when you draw a line from the edge of the wheel towards the centre. 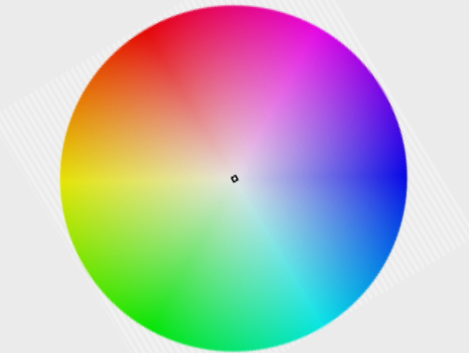 The edge of the wheel represents 100 percent saturation, whereas the centre of the wheel is at zero percent, which is represented by white. But keep in mind that white in the colour wheel simply represents an absence of colour. Then Choose Window > Arrange > Colour Correction. All four scopes should be visible. 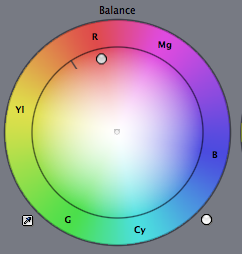 Now click in the Colour Balance control (the dot in the centre of the colour wheel) and drag it towards the Red. Notice that the colour of the shape in the Canvas turns red and that there’s now a definite graph in the Vectorscope that stretches towards the Red. Also notice that the colour channels in the Parade Scope show an increased intensity in the red relative to the green and blue. You can easily modify the saturation (intensity) of the colour by simply adding its complementary colour. The complementary colour of Red is Cyan. Therefore, click in the Colour Balance control and drag the point towards Cyan so that the spike in the red channel of the Parade scope falls. Watch the spike in the red until it’s even with the green and blue spikes. When the colour channels are even, the colour should be neutral. Therefore, by moving the Colour Balance control in the opposite direction, the colour in the image becomes desaturated, or absent of colour. White balance is a way of determining what is white under different colour temperatures. There are three types of light source – incandescent (tungsten), fluorescent, and sunlight. Each of these light sources has a different colour temperature. Generally, indoor lighting has a colour temperature of 3200 Kelvin degrees, which appears reddish, while sunlight has a colour temperature of 5600 K, which appears blue. The human eye doesn’t consciously see these colours, but video cameras have to be adjusted depending on the light in source. A camera that is adjusted incorrectly can produce images with tints that can be subtle or extreme. Instead, you want white to look white under any colour temperature. However, if the whites look yellowish or even blue, then you must find a way to neutralise the colour cast using the Colour Balance controls. First, you need to identify the colour casts, perceiving the subtle tints that show up in video that is not properly white-balanced. 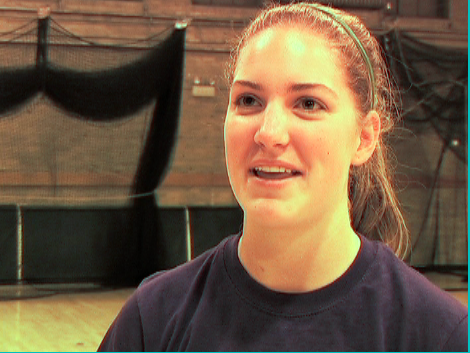 Take for example this image shot in a gymnasium under fluorescent lights. You can see right away that the scopes are spiking in the Red. In addition, you can surmise that the image is just a bit underexposed because the whites are not at the 100 percent line. Choose the Parade Scope in the Layout pop-up menu. You will see the three graphs representing the red, green, and blue channels. The red channel is considerably stronger and is also a bit lighter in the blacks than the green and blue channels. Now select the Vectorscope. You will see that the colours all point towards the red just above the Flesh Tone line (the diagonal line extending towards the upper left that represents the ideal flesh tones on people). 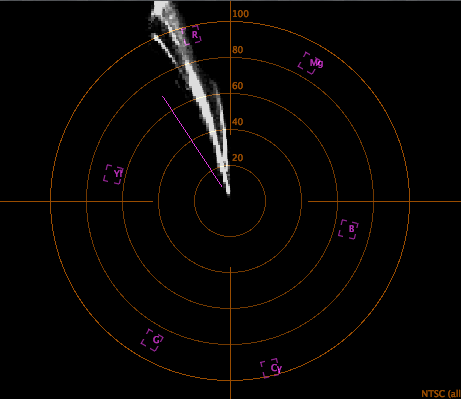 The Parade Scope and the Vectorscope are your best tools for determining the type and severity of the colour cast, and for how much correction you’ll need to make. Once you’ve identified the colour cast, you can attempt to eliminate it using the Colour Corrector 3-way filter. This filter provides Auto-balance colour buttons that can automatically balance an image to make the black and whites neutral and rich. These buttons contain the eyedropper that you will use to sample colours in your image. Click on the Colour Corrector 3-way filter tab in the Viewer. You’ll notice an eyedropper control button at the bottom left of the Colour Balance control. The eyedropper buttons are the Select Auto-balance Colour buttons, which corresponds to each zone of luminance. NOTE: Before you balance the colour, make sure that you first adjust the contrast. Make sure that your lowest black level is at 0 percent and your highest white level spikes at 100 percent. First adjust the Blacks, then the Whites, and then the Midtones. Select the Black Auto-balance button. This is where the colour is perhaps most noticeable in the image. When you click the Blacks Select Auto-balance button, the tool-tip appears with an instruction, asking you to select a colour. The colour should be selected in the Canvas in an area that is supposed to be pure black. Of course, you might find an area that is as close to solid black as you can find. In this case, the dark shadows on the wall near the floor. You want to select an area that is supposed to be black, even though it’s tinted with red. Once you click in the selected area you might not immediately notice the change in the image. But the indicator in the Blacks Colour Balance has moved towards the bottom right, towards the colour Cyan, which is the complementary colour of Red. Also, you may have noticed in the Parade Scope that the Red channel has moved downward a bit closer to the blacks. But we still have a ways to go. Next, you want to choose the Whites Select Auto-balance button and then click on an area that’s supposed to be white. At first, it doesn’t seem to be obvious that there’s any white in this image. But you can find the white in the girl’s teeth. By zooming into the image, you can select a larger area. Immediately, you see a more noticeable effect. Zoom back out. Look at the Parade Scope and you’ll find the colour channels are beginning to spike higher towards the whites. The Vectorscope is also showing the colours just a bit closer to the Flesh-tone line. But there’s still a reddish tint to the image. Next, we try adjusting the Midtones. Typically, when correcting colours you only have to use two Colour Balance controls to balance the image. If there’s nothing white in the frame to sample, then your best bet is to select the Midtone controls and sample something as close to white as possible. The mids take up a larger percentage of the image and the Mids Colour Balance controls the influence of the colours falling between the whites and the blacks. 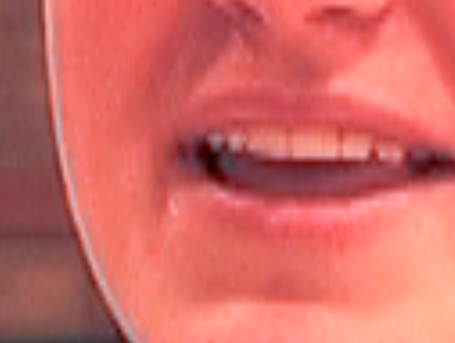 However, when we try using the Mids Select Auto-balance button and sample the girl’s teeth, the entire image immediately takes on a blue tint. This example shows that, sometimes, automatic isn’t always the best solution. In that case, you might be better off to adjust the balance manually. First adjust the contrast with the Blacks, Whites and Mids sliders. Use the Blacks Colour Balance control and find the direction of the complementary colour to the biggest spike in the Vectorscope. Make sure that the colour channels in the Parade Scope become evenly balanced near the blacks. When you’re satisfied with the blacks, then adjust for the whites. Again, move the balance control indicator towards the complementary colour. Lastly, drag the Mids balance control indicator in the direction of the complementary colour, which will be your most subtle adjustment of all. 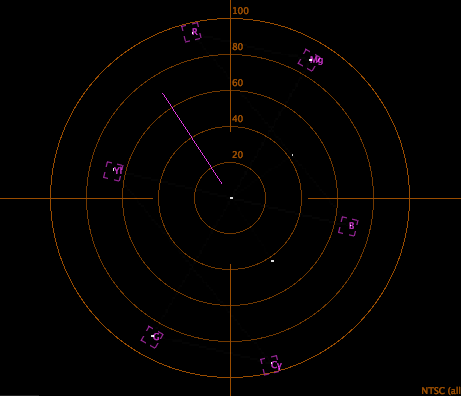 Keep your eye on the Vectorscope until you start to see flesh tones near the Flesh Tone line.